He stood beside Henry VIII, guiding him and enriching him, until the king sent him to the gallows in 1540. After a decade of sleuthing in the royal archives, Diarmaid MacCulloch has emerged with a tantalizing new understanding of Henry’s mercurial chief minister, the inscrutable Thomas Cromwell. History has portrayed the architect of England's split with Rome as a scheming operator with blood on his hands. But MacCulloch also discovered a loving father who took his biggest risk to secure his son’s future; a man of faith and a quiet revolutionary; and a visionary who guided England toward its religious awakening. 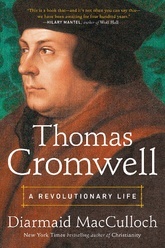 MacCulloch rescues Cromwell from myth and slander to offer a brilliantly balanced look at a figure long shrouded in mystery.